Your #1 fan's name is embossed on the cover, with fun baseball facts and brain teasers inside. What are baseball fans doing when they're not watching baseball? Thinking about watching baseball, of course! And this personalized quiz book is just the thing to keep them entertained, whether it's the off season or just the seventh inning stretch. Your #1 fan's name is embossed on the handsome, cloth-bound hard cover, and printed inside with an optional message from you. 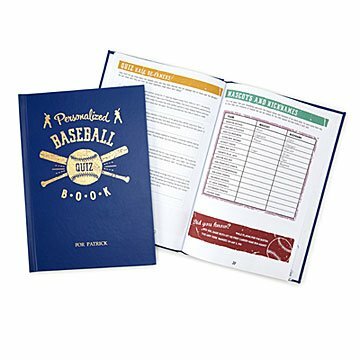 In addition to pages of puzzles, questions, fun facts, and other brain teasers about America's pastime, the book also includes one quiz specifically about the team of your choice, making it a home run of a gift for your special fanatic. Made in the UK. Great for the baseball fan in your life! The personalized touch was great, but I thought is would have more pages.